Anglers from all regions love cruising over to the Ocean Crest Pier, the only privately owned and operated pier on Oak Island, and one of the best venues for great fishing, tournaments, and taking in the scene. Voted the #1 fishing pier in North Carolina by the Fisherman's Post, most all anglers walk away from this pier after a full day of fishing with a great catch or two, and an eagerness to come back the next day for more. 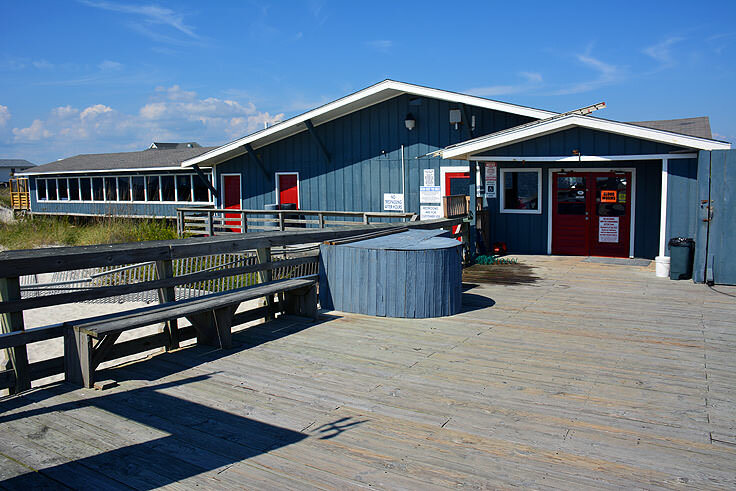 The pier has been owned and operated by the Andrews and Prince Families since 2002, and is one of the few privately owned fishing piers in all of North Carolina. But Ocean Crest Pier makes a splash for a much bigger reason - namely, it's grand size. At 893' feet long with a 50' foot kingfish area, the pier is one of the longest piers in the southern Cape Fear region, and when the fishing is hot, it is also one of its most popular. The 50' foot wide "T" at the end of the long structure is covered by a wooden gazebo, and provides plenty of shade for fishermen who need a break from the sun. The pier itself is all wood, with high railings and plenty of bench seating allowing visitors to drop a line, sit back, and wait for the first bite. 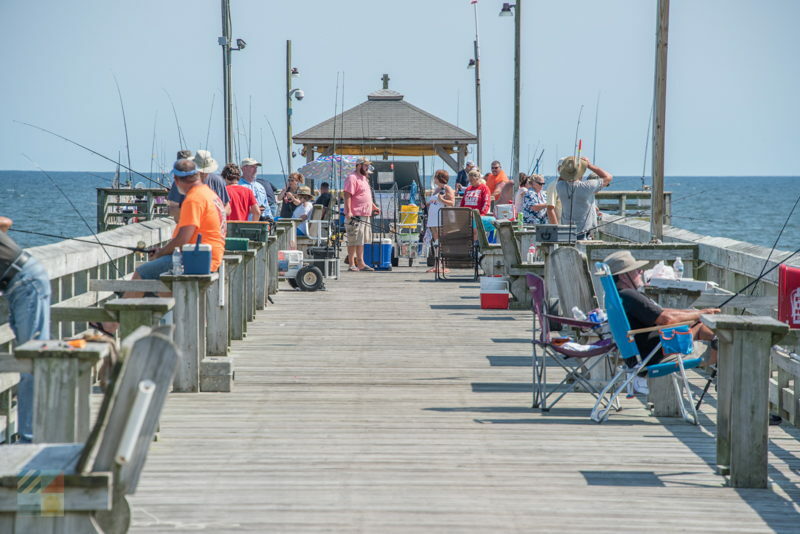 In addition to the prime fishing, the pier has a world of other amenities for fishermen and their families, including a tackle and bait shop to load up on supplies, rod rentals for visitors without gear handy, and plenty of snacks, ice cream and beer to cool off on hot summer days. 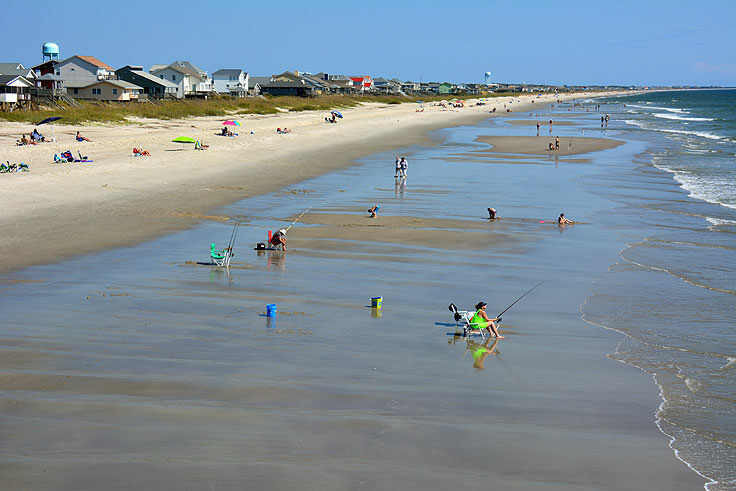 There are also landing nets and cleaning stations on site, as well as handicapped accessible restrooms and beach access for patrons who need a break from a hard day of fishing, and who just want to relax in the sun and surf. A restaurant is also located adjacent to the pier, the Island Way Fine Dining restaurant, which is open seasonally for fabulous fresh meals. With an incredible oceanfront setting overlooking the water and the pier, hungry diners can watch the distant views of what's biting along the Ocean Crest Pier, while enjoying world-class seafood and steak fare. A bar is also located within the restaurant for lazy afternoon cocktails or an opportunity to have a cold one and swap fish stories with friends. As for what's biting at the pier, it all depends on the season , but typical catches include pompano, sheepshead, flounder, bluefish, speckled trout, Spanish Mackerel, King Mackerel, (one of the region's favorite catches), and drum in the shoulder seasons, or cooler months. Pier patrons can chat with the locals at the pier house to see what's being caught and what's in season, or can visit the pier's online galleries and fishing report to explore what other lucky anglers have reeled in. 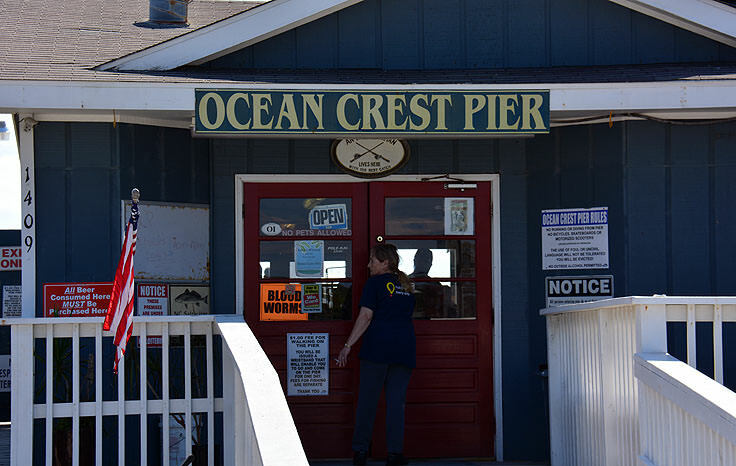 Because of the exceptional fishing that Ocean Crest Pier and Oak Island is known for, the pier is a very popular venue for regular fishing tournaments. A half dozen or so fishing tournaments take place on or adjacent to the pier every year, including the Oak Island Open Pier Tournament which is held in May, the OCP (Ocean Crest Pier) Fun Fest, typically held in June, and even an Oak Island Kids Fishing Derby, which is held in late July and welcomes all anglers ages 12 and under. Visitors with a competitive streak who want to join in the fun can keep an eye on the pier's Facebook Page to see what upcoming events are coinciding with their Oak Island visit. Visitors who just want to enjoy the outstanding views can walk the pier for just $1,00 per person, and fishing rates vary depending on both of the age of the angler and the type of fishing. For bottom fishing adults from 13-60 years old, the rate is around $7 for 1 rod, and $12.50 for 2 rods, while king fishing rates for adults are $16 for 4 rods maximum. Special discounts are given to both seniors over 60, and children under 13. Rods are also available for rent with a small security deposit, and die-hard fishermen can also pick up an annual pass for unlimited pier access. Detailed rates can be found online. The Ocean Crest Pier has gained a big reputation as one of the best places to drop a line, and this long pier has an equally long history of happy anglers and outstanding catches. A favorite fishing hole among locals and longtime visitors alike, with a prime location in central Oak Island, the Ocean Crest Pier is making waves as one of the best places to spend an afternoon or a full vacation angling for the big one. Call 910-278-6674 for current hours.